This section provides instructions for the initial setup and configuration of the WAVE Gateway hardware required to integrate supported radio systems. This section is identical to the instructions received in the box with your WAVE Gateway and is provided as a copy for troubleshooting purposes. IMPORTANT: The WAVE Gateway requires an Internet connection. It will not function without an Internet connection. You may isolate the Radio System by placing a switch between the Gateway and the Radio system if you wish (as shown in the diagrams below). For Capacity Max systems you must ensure the WAVE Gateway is directly connected to the Capacity Max radio system hardware. Note: If the Capacity Max switch is already connected to the Internet then the intermediate switch is unnecessary. To function with a Radio System, the WAVE Gateway requires wired network access to both the customer’s radio system and the WAVE service running in the Cloud. In order for the service to work properly, the following ports need to be opened OUTBOUND on the Customer Network. These ports allow the WAVE Gateway device to connect to WAVE servers and the radio system on the local network. The following ports and their associated URL must be opened OUT/IN BOUND only. If you have questions about the URL you should use for a port, then contact support for further instructions. Required by the WAVE Gateway to connect to the WAVE voice services. Required for secure MQTT messages over TCP/UDP port to the AWS IOT Service for device management. Required for the WAVE Gateway to connect to the WAVE Service. Any entry in the *.poc01.waveoncloud.com subdomain. Required for Splunk to update log level configuration. Required for Splunk to send device logs. This is the port the master repeater is using for Link Establishment and needs to be opened from the WAVE Gateway to the radio system. This is unique to each radio system. This is the port that will be used by the repeaters to communicate with the WAVE Gateway and need to be opened inbound from the radio system to the WAVE Gateway. The network needs to at least 1 Mbps dedicated to the WAVE Gateway. Skip this procedure if you have already upgraded your radio repeaters to version R02.07.00.04. Additionally, you may run an older version of the repeater firmware if the radio system includes an active NAI Voice license. Repeater firmware is available on Motorola Online and is version R02.07.00.04. Firmware upgrade is performed through the Device > Update option in CPS. Note: Radio Systems are sold through a Dealer network and it is the Dealer’s responsibility to upgrade and maintain the system. If you require an upgrade, contact your Dealer. Repeater upgrade required without NAI Voice license. Power on the WAVE Gateway. The WAVE Gateway comes equipped with a WiFi connection for initial configuration. Login to a PC with WiFi capability. Ensure WiFi is turned on. Click the Wireless icon in the lower right corner. 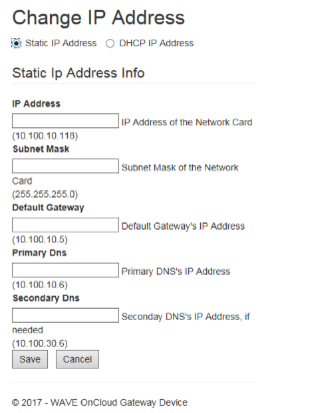 Connect to the WiFi SSID using MotoGateway as the Password. Open a web browser on the PC and enter http://192.168.137.1/ (For Dell 3050/3060 Gateway hardware). Note: Use http://192.168.173.1/ (for older Dell 3040 Gateway hardware). If prompted for a Username and Password use admin/MotoGateway. You will be given the option to change this after log in. Note: If you forget your password please contact support. The WAVE Gateway main interface opens in the web browser. 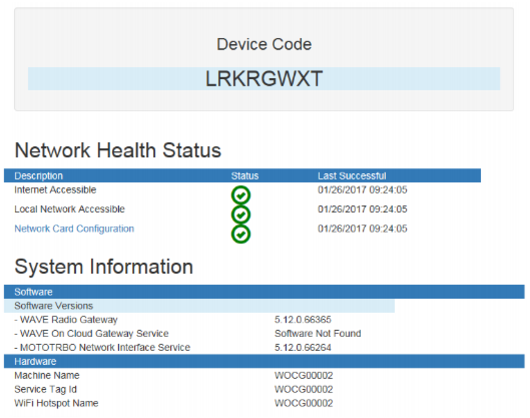 If you see a red X thru network card configuration, click the link- Network Card Configuration. 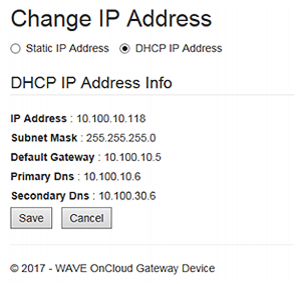 The Change IP Address page opens. To proceed with the rest of Broadband and Radio Configuration and Setup see: Quick Start – Broadband. You will need the Broadband steps to configure WAVE for testing. After that you will proceed to Quick Start – Radio Integration to complete radio setup.